Seafood in a Bucket, the seafood restaurant that has taken Dubai by storm early last year, has finally opened a new branch! Finally! I hope this would be the answer to the longest restaurant queue I've ever seen in my entire life. It's no surprise why Seafood in a Bucket gained immediate popularity. During my first visit in their first branch in Karama, I had a strong feeling that people will love the restaurant as much as I do. 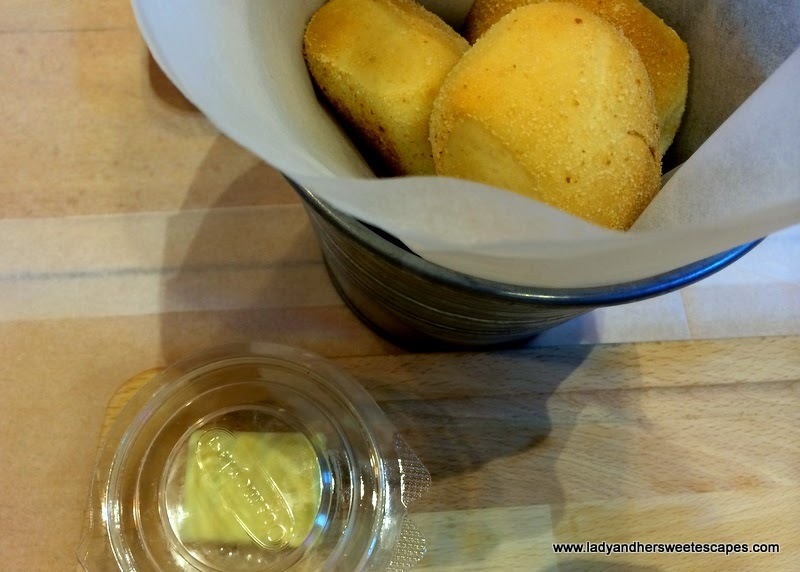 Dining is fun and fancy, and the prices are fair enough for budget-conscious expats! The all-new Seafood in a Bucket in Ansar Gallery is a much better version of their first branch. It's bigger and funkier! Last month, I dined at the new restaurant three times. 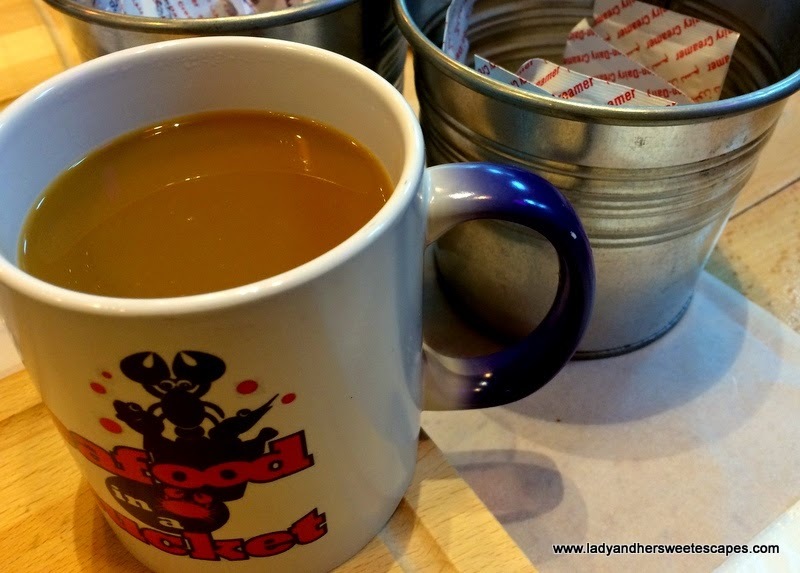 As the long waiting time is a downside to some dining experiences at Seafood in a Bucket, I opted to check it out at three different timings. I wanted to see how it goes for breakfast, lunch and dinner. Yep, they have breakfast and it's amazing! And what I have noticed, based on my visits, is that if you want to avoid the queue, go for an early lunch or for a late dinner. We easily got a table for breakfast at 9 am and lunch at 11:30 am. As for the dinner, we went at 10 pm and still had to wait a few minutes. I'm not a morning person, but one weekend I tried my very best to wake up at the sound of my husband's alarm. I went with him for an early morning jog. He jogged, I walked! That seldom happens, so as a treat, he agreed to dine out for breakfast to make up for the extra calories I have burned. Hahah! It was the right time to try out Seafood in a Bucket's breakfast offerings. Breakfast started with a good cup of brewed coffee. It was served in magic mug that changed its color when the hot drink was poured. Then, a bucket of hot pandesal, fresh from The Bread Workz bakery, was brought to our table. We were able to consume every piece before our big breakfast arrived. There's nothing like a classic Pinoy pandesal in the morning! Seafood in a Bucket's breakfast set meals are pretty heavy. 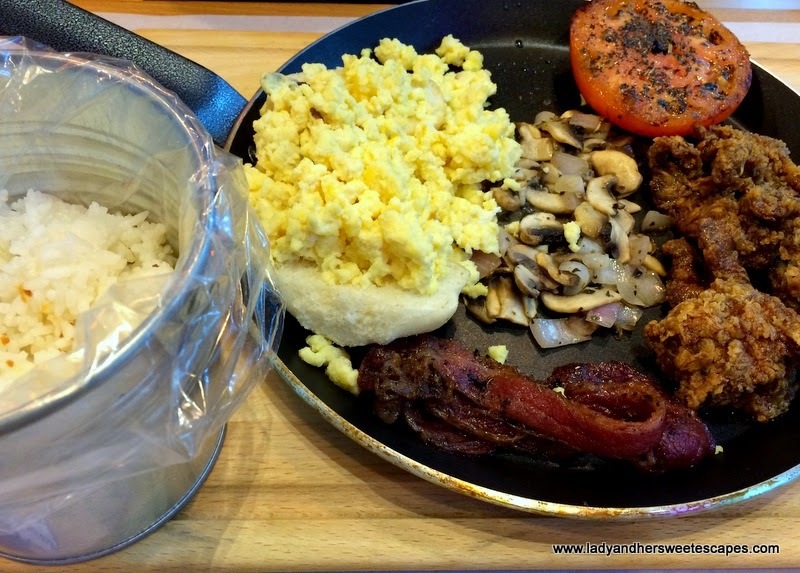 Served in a pan are your choice of breakfast main dish, turkey bacon, scrambled or sunny side up eggs on top of a sliced pan de sal, sauteed mushrooms and herbed tomato... plus unlimited garlic rice or unlimited bread in a bucket! Now, that's what you call BREAKFAST! Ed had crispy garlic beef teriyaki. It looks like beef tapa but doesn't tastes like it. It's actually unique to my taste buds. It is savory with a hint of garlic, tender but crunchy on the outside! I had chicken sausage. It has a subtle taste and The Husband really loved it. Since I'm more into flavorful stuff, I enjoyed the sauteed mushrooms so much and reached out for more crispy beef. 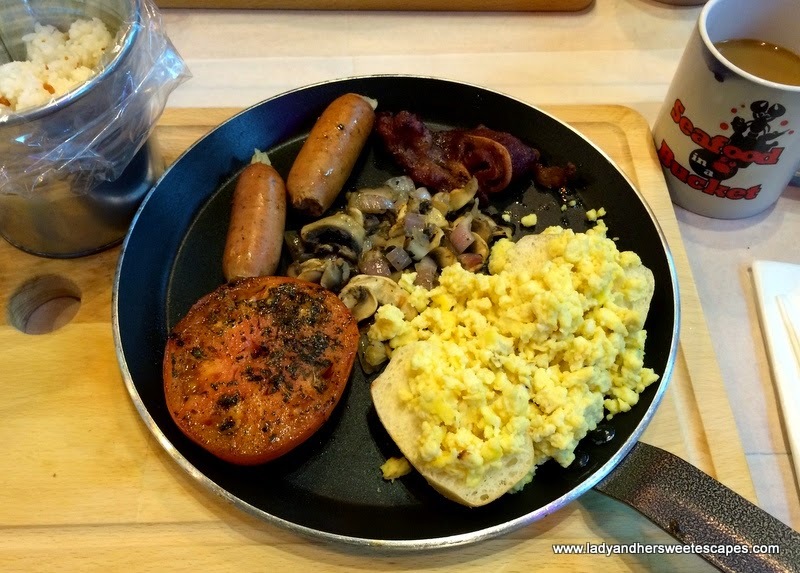 Breakfast in a pan! Everything is uniquely served at Seafood in a Bucket! A couple of weeks back, I had dinner at Seafood in a Bucket with my husband, together with one of the coolest couples we have ever met! I guess SoloflightEd needs no further introduction, but can I just say how lucky we are to be friends with The SoloflightEd, Travel Bloscars 2013's Best Male Blogger in the Philippines, and his lovely girlfriend Jana! Yah, I'm still fangirling over these two. Hahah! Anyhow, let's talk about our dinner! Seafood in a Bucket was still jam-packed when arrived at 10pm. We had four buckets of yummy seafood, a bucket full of chicken wings drizzled with sweet chili sauce and a bucket of mozzarella sticks. I had my favorites; Lobster in plum sauce and hammour fillets in black pepper sauce. It was my first time to have mussels and clams. I'm not a big fan of those shellfish, but Seafood in a Bucket's special sauces made them very pleasing to my palate. I never got to taste the chicken as my full concentration was on the seafood. I bet it's good as I never heard any complaints from the three. The good news for the maki monster in me is Seafood in a Bucket's sushi bar! Right in the midst of seafood dining, I happily devoured a delicious serving of California Maki! Of course, I shared some! I was so delighted to see a variety of Japanese rolls in the new menu. They are pretty cheap as well! Another new offering at Seafood in a Bucket in Ansar Gallery are The Bread Work'z bread and pastries. Right after the seafood dinner, we shared a custard cake and some vanilla cupcakes. The yummy baked goodies sweetly shooed off the seafood after-taste in my mouth; perfect ending to an excellent seafood meal!